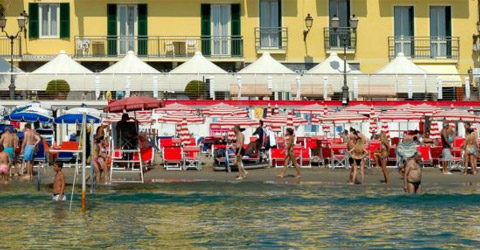 By agreement with the owners of the “Bagni Ideale” beach located directly in front of the hotel, our guests are granted modern beech service in a supervised environment with full comfort. If you wish to reserve a particular spot (front row, private cabin, etc..) please contact the beach management directly at (+39) 333-3998485, or at the following e-mail address bagniideale@hotmail.it. Beach is not included in full board price.